How do you bury thread ends which are too short to thread through a needle eye or when you just don’t want to take time to thread a needle? BERNINA Brand Ambassador Renae Allen of RGA Design LLC shares a technique she used in tailoring and garment sewing to send threads to the inside. It works great for quilt threads! 1. Choose a thread color different from your sewing thread. Fold it in half and thread both cut ends through a needle so there is a loop on the bottom. 2. Reach through the loop, grab the thread ends and pull them through the loop. 3. 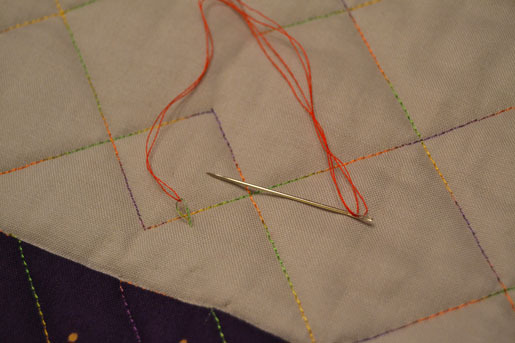 Hold on to the ends and while pushing the needle through inside of the quilt and back out a short distance away. The needle and thread loop pulls the ends through the inside of the quilt. 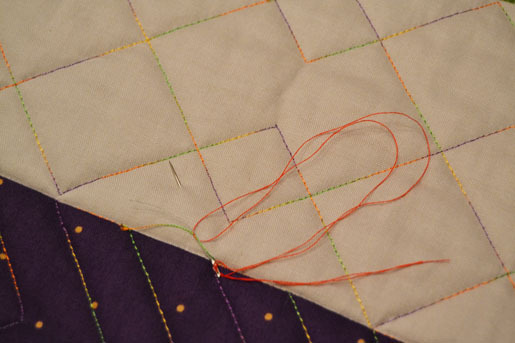 If the ends come out with the loop just tug slightly and trim so the ends pull in and are buried between quilt layers. I would like to see a video because I’m not sure I follow this! It sounds like something I need to know. Thanks! You said this is for when threads are too short or “when you just don’t want to take time to thread a needle”; however, you ARE threading a needle with the contrasting thread. That part of your tip just didn’t make sense. Or are you saying that once you’ve threaded the needle with contrasting thread, you just keep it threaded and use it more than once? THAT makes sense. I will have to give this a try, especially with threads that are too short. I think I understand to a point; however wouldn’t the too short stitch still want to pop out once you try to pull it through with the new threaded needle…? I suppose I am as someone else stated I need to see the process done to fully process this procedure, otherwise this just doesn’t click.